The UNI Varsity Men's Glee Club will offer their highly anticipated holiday concerts. These sell-out events feature the Glee Club men performing holiday favorites and beautiful winter songs. This event is ticketed. For tickets, call 319-273-4TIX. Performances on Nov. 30 at 7:30, and on Dec. 1 at 2:30 and 7:30. Current UNI students who wish to live on-campus for the 2019-20 academic year can begin to select their room. (Students currently living off campus must have a completed housing contract to participate.) Students may reserve their room in any hall and select a meal plan. Priority reservation dates were distributed to students in October. 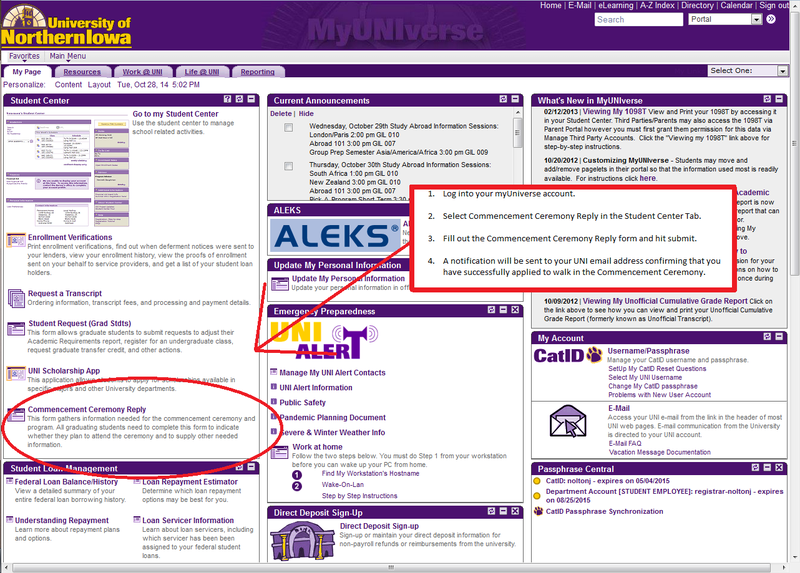 Students can check the date and time of their individual priority reservation date by logging-in to the housing & dining contract. Priority reservation dates run through December 3. Link to Event: Learn more about recontracting. Camp Adventure interview session. For more information on how to attend and be a part of the program, please contact unicampadventure@gmail.com. Join Rod Library’s UNI Edits Wikipedia: People of Color Edit-a-thon. Training, food and childcare will be provided free of charge. Activities for de-stressing include slime, sand, aromatherapy balls, relaxing music and more. A perfect way to celebrate the holidays. Come join the UNI School of Music ensembles in celebrating the joys of the season. Enjoy holiday favorites, majestic, winter-inspired works, and more. This event is ticketed. For tickets, call 319-273-4TIX. The North American Review will celebrate its 50th year at UNI by hosting a writing conference April 19-21, 2019. The editors invite poster submissions (due February 15, 2019). Students are especially encouraged to apply. The P.E.T.P.A.L.S. will visit UNI on weekdays as part of our de-stressing for finals events. A graffiti wall will be available. De-stress with some cute dogs and cats, and draw on our graffiti wall. UNI Orchesis Dance Company will hold auditions for the spring semester. Bring any dance shoes you have (ballet, tap, jazz) and wear form fitting clothing, such as a leotard and tights or leggings. CAB Film: "Crazy Rich Asians"
CAB will be showing "Crazy Rich Asians." Admissions is free; pizza and cookies will be provided. Opening Reception: Dec. 6 at 7 p.m. The following students are pursuing Bachelor of Fine Arts degrees in their respective emphasis areas and are exhibiting new artwork to fulfill graduation requirements: painter Tyberius Anderson, photographer Elinor Jane, and performance artist Caitlin Mary Margarett. All events are free and open to the public. Gallery hours are from 10 a.m. to 7 p.m., Monday through Thursday; noon to 5 p.m., Friday and Saturday; and by appointment. The gallery is located at the corner of Hudson Road and West 27th Street, on the main floor of Kamerick Art Building South. Link to Event: "B.F.A Group Exhibition"
All ages are welcome to join the Friends of the UNI Museum to the "Holiday Festival of Lights." Share stories about holiday traditions around the world, treats, create decorations and frost cookies. Free admission, open to the public and free parking for the event. The Safe Zone Ally program is a campus-wide opportunity designed to support the continued growth of an inclusive campus community. All are welcome to take both Phase one and Phase two in-person training to become Safe Zone Allies. Registration is required. To request a group training, e-mail lgbt@uni.edu. Please note: Phase one begins at 1 p.m. and Phase two begins at 3 p.m. Enjoy some strawberry and chocolate chip muffins. Undergraduate Research Presentation: Sunny Side Up: Solar Irradiance in Cedar Falls, Iowa. Isaac Neppel will present his research into the effect of sky cover on solar irradiance measured on the roof of Latham Hall in 2016. The results provide a one-year climatology that can provide a baseline for qualitatively assessing the aerosol content of the atmosphere on a given day in Cedar Falls. This presentation is part of the degree requirements for the Bachelor of Science in Environmental Science program. Brenna Wolfe, NISG director of gender violence prevention, will discuss gender issues, gender violence and UNI’s campus climate. This will be safe space to discuss any suggestions or concerns. The discussion will be audio-recorded, but all responses will be coded as anonymous. There will be no mandatory reporters and no staff in the room. See the “best of the best” live and digital performances from our beginning and advanced communication classes. Experience all kinds of texts in this one-hour celebration of performance! The Commencement Reply is available and will remain open until Friday, December 7, 2018, at 4:30 p.m. Please note that the deadline for inclusion in the printed program was Saturday, November 10. For more information, visit our website. The purpose of Ankara Night is to inform others about traditions that have a negative impact on Africa as a continent. Discussion topics will be sexual assualt, the deaf community, bleaching and colorism, and refugees. Under the direction of conductor Michelle Swanson, the UNI Children's Choir will offer their winter concert. This event is free and open to the public. For the final screening of the year, the Film Appreciation Club invites you to watch the 1954 version of "A Star is Born," starring Judy Garland and James Mason. Directed by the iconic George Cukor, this tale tells the heart-wrenching story of two lovers who both feel the affects of the music industry as one rises and the other falls. Recently the story has undergone a fourth rewrite/remake, so come check out a taste of what has inspired Bradley Cooper's 2018 version. The UNI Suzuki School’s Northern Iowa Youth Orchestra will present a winter concert. For more information, contact Cathy.Craig@uni.edu. Ceremony for graduates of Fall 2018. For more information, visit our website. The New Horizons Band will offer its winter concert. Under the direction of Diana Blake, the New Horizons Band features musicians 55 and older who travel from all over Iowa. This event is free and open to the public.